Comes with two Mystery BONUSES! Refined WordPress theme combines the simplicity and ease of use a traditional web site editor with the search engine friendly content management system that's made WordPress the #1 blogging platform. * TEN different attractive colors - empowers you to produce exactly the mood you want for your particular niche. * Instant uploading of your choice of header - no more struggling to replace code: it's just a simple point and click job. * Multiple front page layouts - these 20 attractive and practical layouts will satisfy even the most discerning site-master. * Multiple layouts for other pages - extra layout options will make your blog really shine. * Your very own logo - your choice of a simple static image or an eye-catching dynamic text (powered by sIFR). * TWO navigation menus - both powered by Wordpress's new navigation system for an ultra-professional appearance: #1 is a drop down menu to four levels for the top of your page and #2 is for the essential footer links to please Google, such as 'Privacy' and 'Contact'. * Embed ANY video format (and as many as you want on a single page) with the built-in video player - video is great to increase sales and generally enhance your visitor's experience and help with your ranking (because the longer visitors linger, the higher Big G rates your site). * You can use any video from the sharing services PLUS your own mpeg, .mov, .flv and even .avi. Add splash images to the videos or even set them up as pop-up videos. 100 point and click. * Unlimited sidebars exactly where and when you want them - not only can you choose from left, right or no sidebar . . . you can ALSO create different sidebars for each page. 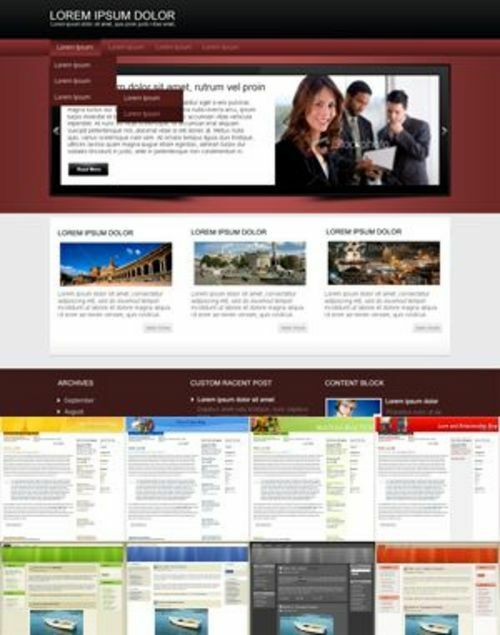 * Built to WordPress's 'preferred' standard - no stone left unturned to give you the very best theme - ever. * No need for external plug-ins - because these can cause problems if they aren't updated and can even allow hackers in. * Create as many picture galleries as you want - and you can have them on ANY page or post. What's more, they come with your choice of six different built-in light box effects including an automatic slideshow! * Custom widget collection - spice up your pages with these clever add-ons, such as the 'Recent post' widget to highlight posts from a specific category. And you can even extend autoresponder support to sidebars with the 'Autoresponder' widget. * Favicons - there's built-in full support for favicons too. * Professional quality typography to increase sales - visitors unconsciously size you up according to the appearance of your blogs, so the more professional your type fonts and general appearance are, the more they are inclined to trust you and BUY your products or your affiliate recommendations. * A "QuickStart" guide with easy to follow click by click instructions in plain English absolutely NO computer gibberish - and a built-in, heavily illustrated manual to refer to at any time. * A dedicated support forum - manned by the very guy who actually created the theme (no hiding behind a 'help' desk for me). * Build in SEO enhancement - forget fiddling around with various plug-ins, it's already seamlessly integrated for you. * Enhanced SEO coding - super-optimized and carefully structured to make it quick and easy for the search engine robots to home in on the exact content and index the page precisely WHERE you want it to be. * Complete control over the search robots - you are in the driving seat with FIVE options, giving you total mastery over where they may go and where they may not - and all with a few mouse clicks. * Lightening fast loading - because the faster your site loads, the higher your score with Google (and your visitors will still be there too). * Video integration - a snap - because video keeps your visitors on the site longer, and Google gives more weight to your site the longer your visitors stay. * Facebook integration - take charge of what people post on their walls when they like your site with this point and click feature. * Unlimited content columns - divide your content your way with shortcodes for multi-column layouts and colored text boxes. * A meta description for every separate page - Google indexes pages - not websites - so this gives you a massive advantage, because Google will usually show the first 160 characters of this as your search engine entry. So it's your golden opportunity to 'sell' yourself and convince the searcher to visit your site. * Ramp up your conversions - total one time setup of analytics and conversion tracking to be certain you're squeezing out every last cent of profit. * One click squeeze page creation PLUS autoresponder integration with all the major services - creating your mailing list is the fast track to wealth. And it's a snap to set up here. Even set up per page "popup" forms. * Create pages focused on a single category - this is perfect for grouping articles and other content for enhanced visitor experience leading to MORE SALES. * 'Follow me' widget - links you to all your social site profiles for increased web presence and even more traffic from Twitter and Facebook (who now gets more traffic than even Google). * Facebook Likebox integration - get extra 'votes' from your visitors with this superb built in widget, which actually encourages more votes by showing the most recent people to have 'liked' your site! * Single- click sales page and squeeze page creation - money-making is a snap. * Video salespage creation - video sales pages have been proved to increase sales by as much as three times. Get 16 professionally-designed magazine-style Wordpress themes for peanuts! You can use these themes for almost any purpose, e.g. start your own blog, use them to create and flip blogs or even add them to your membership site. a) Advanced SEO Optimization: These themes are already optimized for SEO; in other words, you don't need to use any third party SEO plug-in or optimize your theme by hacking it! b) Flexible Navigation Menu: You can link to a custom page, a specific category, another blog, or even to an affiliate site! Bottom-line is: you're not limited to only Wordpress pages! c) Plug-and-Play Clickbank Commissions: Simply enter your Clickbank ID and you can make money (up to $32 per sale) from affiliate commissions 24/7 when some buys our other related products. d) Plug-and-Play Adsense Income: The Adsense-Ready features of these themes will instantly embed your Adsense ID on all pages in the most strategic locations, all 100 compliant with Adsense policies. e) PSD source files are also available for EACH theme! BONUS #3: To make the deal even sweeter for you, we are even including an announced bonus with it! Only those who purchase this product from us would be able to get the bonus at NO cost! 500 Premium Wp Themes, Plr Included!